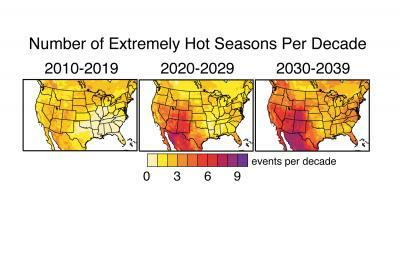 By 2039, most of the US could experience at least four seasons equally as intense as the hottest season ever recorded from 1951-1999, according to Stanford University climate scientists. In most of Utah, Colorado, Arizona and New Mexico, the number of extremely hot seasons could be as high as seven. Exceptionally long heat waves and other hot events could become commonplace in the United States in the next 30 years, according to a new study by Stanford University climate scientists. "Using a large suite of climate model experiments, we see a clear emergence of much more intense, hot conditions in the U.S. within the next three decades," said Noah Diffenbaugh, an assistant professor of environmental Earth system science at Stanford and the lead author of the study. Writing in the journal Geophysical Research Letters (GRL), Diffenbaugh concluded that hot temperature extremes could become frequent events in the U.S. by 2039, posing serious risks to agriculture and human health. "In the next 30 years, we could see an increase in heat waves like the one now occurring in the eastern United States or the kind that swept across Europe in 2003 that caused tens of thousands of fatalities," said Diffenbaugh, a center fellow at Stanford's Woods Institute for the Environment. "Those kinds of severe heat events also put enormous stress on major crops like corn, soybean, cotton and wine grapes, causing a significant reduction in yields." The GRL study took two years to complete and is co-authored by Moetasim Ashfaq, a former Stanford postdoctoral fellow now at the Oak Ridge National Laboratory. The study comes on the heels of a recent NASA report, which concluded that the previous decade, January 2000 to December 2009, was the warmest on record. In the study, Diffenbaugh and Ashfaq used two dozen climate models to project what could happen in the U.S. if increased carbon dioxide emissions raised the Earth's temperature by 1.8 degrees Fahrenheit (1 degree Celsius) between 2010 and 2039 – a likely scenario, according to the International Panel on Climate Change. In that scenario, the mean global temperature in 30 years would be about 3.6 degrees F (2 degrees C) hotter than in the preindustrial era of the 1850s. Many climate scientists and policymakers have targeted a 2-degree C temperature increase as the maximum threshold beyond which the planet is likely to experience serious environmental damage. For example, in the 2009 Copenhagen Climate Accord, the United States and more than 100 other countries agreed to consider action to reduce greenhouse gas emissions "so as to hold the increase in global temperature below 2 degrees Celsius." But that target may be too high to avoid dangerous climate change, Diffenbaugh said, noting that millions of Americans could see a sharp rise in the number of extreme temperature events before 2039, when the 2-degree threshold is expected to be reached. "Our results suggest that limiting global warming to 2 degrees Celsius above preindustrial conditions may not be sufficient to avoid serious increases in severely hot conditions," Diffenbaugh said. For the GRL study, the researchers analyzed temperature data for the continental U.S. from 1951-1999. Their goal was to determine the longest heat waves and hottest seasons on record in the second half of the 20th century. Those results were fed into an ensemble of climate forecasting models, including the high-resolution RegCM3, which is capable of simulating daily temperatures across small sections of the U.S.
"This was an unprecedented experiment," Diffenbaugh said. "With the high-resolution climate model, we can analyze geographic quadrants that are only 15.5 miles (25 kilometers) to a side. No one has ever completed this kind of climate analysis at such a high resolution." The results were surprising. According to the climate models, an intense heat wave – equal to the longest on record from 1951 to 1999 – is likely to occur as many as five times between 2020 and 2029 over areas of the western and central United States. The 2030s are projected to be even hotter. "Occurrence of the longest historical heat wave further intensifies in the 2030-2039 period, including greater than five occurrences per decade over much of the western U.S. and greater than three exceedences per decade over much of the eastern U.S.," the authors wrote. The Stanford team also forecast a dramatic spike in extreme seasonal temperatures during the current decade. Temperatures equaling the hottest season on record from 1951 to 1999 could occur four times between now and 2019 over much of the U.S., according to the researchers. The 2020s and 2030s could be even hotter, particularly in the American West. From 2030 to 2039, most areas of Utah, Colorado, Arizona and New Mexico could endure at least seven seasons equally as intense as the hottest season ever recorded between 1951 and 1999, the researchers concluded. "Frankly, I was expecting that we'd see large temperature increases later this century with higher greenhouse gas levels and global warming," Diffenbaugh said. "I did not expect to see anything this large within the next three decades. This was definitely a surprise." The researchers also determined that the hottest daily temperatures of the year from 1980 to 1999 are likely to occur at least twice as often across much of the U.S. during the decade of the 2030s. "By the decade of the 2030s, we see persistent, drier conditions over most of the U.S.," Diffenbaugh said. "Not only will the atmosphere heat up from more greenhouse gases, but we also expect changes in the precipitation and soil moisture that are very similar to what we see in hot, dry periods historically. In our results for the U.S., these conditions amplify the effects of rising greenhouse gas concentrations." Besides harming human health and agriculture, these hot, dry conditions could lead to more droughts and wildfires in the near future, he said. And many of these climate change impacts could occur within the next two decades – years before the planet is likely to reach the 2-degree C threshold targeted by some governments and climate experts, he added. "It's up to the policymakers to decide the most appropriate action," Diffenbaugh said. "But our results suggest that limiting global warming to 2 degrees C does not guarantee that there won't be damaging impacts from climate change." The GRL study was supported by the U.S. Department of Energy and the National Science Foundation. The high-resolution climate model simulations were generated and analyzed at Purdue University. GRL is a publication of the American Geophysical Union. This article was written by Mark Shwartz, communications manager at the Woods Institute for the Environment at Stanford University.